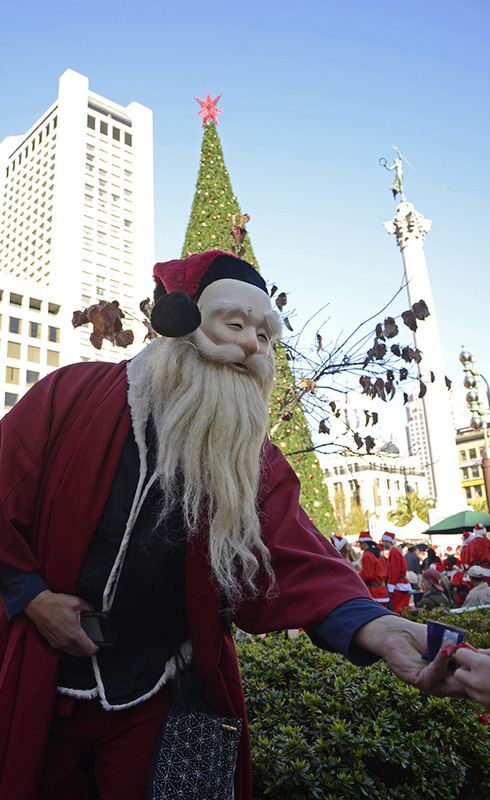 Here Comes Santa Claus: SantaCon SF! I’ve told you guys before that we San Franciscans love our big outdoor celebrations, and it’s even better if it’s a dress-up affair, because I’ve also told you that San Franciscans love wearing costumes. 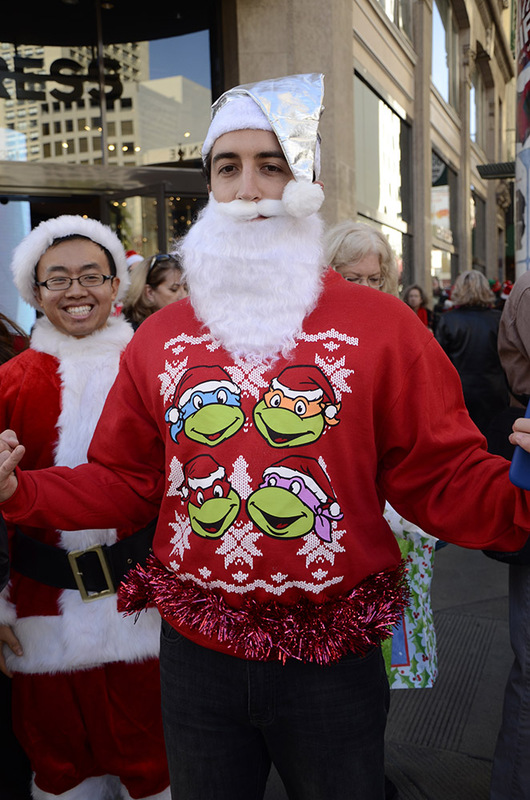 And last weekend’s annual SantaCon celebration gave the city a sweet reason to indulge in both. I gave you a hint of this year’s wackiness with the pic I posted as part of last week’s Weekly Photo Challenge, and now you can witness the event as I saw it, up close and personal in all its crazy glory. As you can see, it’s Christmas cranked up to 11, with all the looniness one can expect when a lot of San Franciscans get together to celebrate, especially when temps in the low 60’s make for a perfect winter’s day. SantaCon is essentially an annual day-long pub crawl that’s described by its organizers as “a nonsensical Santa Claus convention that happens once a year for absolutely no reason.” It’s also known as Santarchy, Santa Rampage, the Red Menace, and Santapalooza. 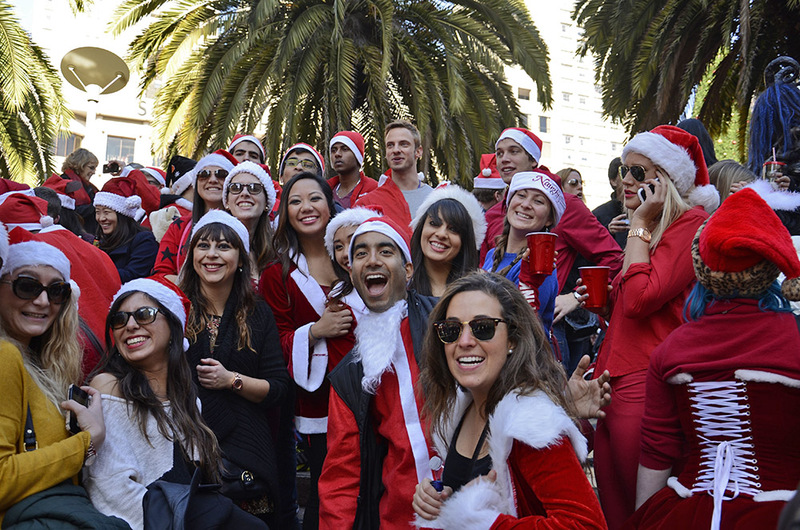 The first SantaCon was held in San Francisco in 1994 and events now take place in 321 locations in 44 countries, according to their website. This year’s San Francisco event was held in the big plaza at Union Square, right in the heart of the city’s shopping district. 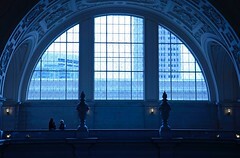 Union Square is a popular place with residents and tourists alike, what with its upscale stores, restaurants, pubs and hotels, and its close proximity to the Powell Street cable car line. It’s normally a pretty bustling place, but the sight of thousands and thousands of Santas converging on the plaza, and the dismayed and sometimes shocked look of visiting tourists, was almost surreal. Here in San Francisco participants are encouraged to bring a new toy to donate to the annual San Francisco Fire Department toy drive. Those toys will be given to needy kids in the city who might not get anything at Christmas. And by the looks of the big barrels that were being filled in front of Lefty O’Doul’s pub on Geary Street, people were certainly in a giving mood. Of course, everyone also brought the larrikin spirit of the holidays with them, and you’d have to be a total Scrooge to not to get completely swept up in it. For one day in December, San Francisco really is the happiest place on earth, and being around that much happiness is infectious. The event started at noon, and by one-thirty the plaza was packed with Santas (and reindeers, polar bears, elves, Grinches, gingerbread men, Darth Vader and hundreds of the worst holiday sweaters ever). It wasn’t long before Union Square looked like a surreal mash-up of Fellini and National Lampoon’s Christmas Vacation. As SantaCon is in essence a pub crawl, the crowd gradually began to dissipate as some made their way along designated pub crawl routes, while others jumped on MUNI underground en route to Duboce Park, about three miles south of Union Square, for a snowball fight of epic proportions. I’m sure not sure who put down the little patch of manmade snow (more like ice), but as you can see, the action got fast and furious as the crew at the snowbank took on the crew on the hill. It was all in good, clean fun, though, and no one got hurt (even though I got totally nailed in the shoulder; a thick hoodie minimized any damage). A snowball fight in San Francisco? It was a perfectly wacky ending to a perfectly wacky day! I hope these pics will do the same for you! Happy holidays! Check out the gallery after the jump. This entry was posted in Christmas, Holidaze, Photo Gallery, Photography, San Francisco, Stephen Kelly Creative, Stephen Kelly Photography and tagged Christmas, Holidaze, Photography, San Francisco, Santa Claus, SantaCon, Stephen Kelly Photography. Bookmark the permalink. 21 Responses to Here Comes Santa Claus: SantaCon SF! Looks like a good time was had by all. You captured the fun. Happy Holidays! Thanks Honie! Happy holidays right back at ya!!! OMG, amazing pics!!! This looks SO awesomely fun. Great shots! Hey there Impybat … I have a feeling you would just love this! hehe … hey there, guat … that type of fun should be illegal! yah, it comes at a good time of year … you got the feeling people were looking for a kooky release from all the other crap that goes with this time of year. yah, you would get right into the high-spirited, larrikin fun of it all! 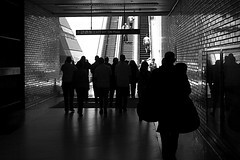 I love that City! Great photos. I think my favorite is the santas sitting around the white table having a beer together. What fun!! Hi Angeline … and happy holidays to you! omg … it was so much fun … it really was hard not to get caught up in it. It was SO San Francisco! Hee hee! Stephen, this whole post is great. Can’t decide which pic is our favorite, but the curious Santa-dachshund is a contender!! hey geeks … thanks for that, and thanks for dropping by. hehe .. yah, that poor dachshund didn’t know what to make of all the Santapalooza going on around him. Hi there James … thanks for dropping by my blog! it was amazing as it looks! Brilliant gallery … loads of happy Christmas, but can only happen in US – It think … we are very small in being mad about Santa, even if he lives up in Lappland. But what I love about our Santa (Jultomten) .. is that he knocks on every door and hand out all gifts in person on the evening of 24th. You don’t have that in US???!!! 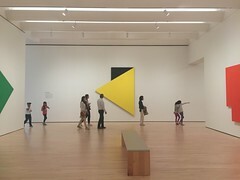 Love your gallery. Mad SF again. haha! no, we don’t have that here in the US! I’ll have to talk to Santa to see it we can do something about that! Yep … Mad SF again! Stephen, I think the kids over that would love to have a visit by Santa *smile .. so I leave that up to you. Wonderful photos as always, Stephen. Thanks. Thanks Allan! I’m glad people are getting a kick of these pics! OMG … so much Fun!!! ya really had to be there, but i hope these photos came close!